I wrote earlier about Olentangy School Board member Jennifer Smith's crusade to change the way their Board does business. Her latest battle occurred during their August 26 regular Board meeting, which you can listen to here. It's a little like watching the first Rocky movie. Rocky was all heart and not much style. Apollo Creed was the reigning World Heavyweight Champion. He was highly skilled as a boxer, and to see him in the ring was like watching a great artist. When Rocky would step in to make a punch, Creed would counter and land two or three on Rocky. But Rocky never gave up. He took a lot of punches, and landed a few good ones of his own. The two fighters pummeled each other to exhaustion and great injury. Ms. Smith is continuing to slug away as well, with more heart than style. To make this analogy work, she needs to have an opponent. While her opponent is obviously the rest of the Board as well as the Superintendent, the style leader is clearly Dimon McFerson, the retired CEO of Nationwide Insurance. Mr. McFerson has spent a good deal of his career in the politics at the top of a major corporation, and along the way would have needed to develop the ability to win fights by controlling the ring, and doing so with style. Whether you're talking about a corporate Board, the governing Board of a charitable organization, or a School Board, half the battle is won by controlling the agenda. In the case of the Olentangy Board, the agenda is set by the Superintendent and the Board President, although one comment during the meeting suggests that Mr. McFerson, as Vice-President of the Board, is involved as well via a Friday breakfast he attends with the Superintendent and President. Their Board's policy seems to be that if any of the other three Board members want something on the agenda, that Board member needs to have a conversation with at least one other Board member and gain concurrence. Not agreement on the point, just agreement to discuss it. Their standing agenda also has, as one of the first items, the approval of the agenda. At that time, any Board member can make a motion to add, change or delete agenda items. By Roberts Rules of Order, that motion requires a second to place it into discussion, followed by a majority vote in favor in order to enact the motion. Ms. Smith's motion to change the agenda died for the lack of a second. She's countered this in the past by stepping down from the Board table and addressing the Board as a private citizen. It's an unorthodox solution, but she seems to have a cheering section, although I'm sure it annoys the other Board members no end. She continued to slug away during the rest of the meeting. It wasn't always pretty. She has a habit of interrupting others when they're talking, often with little jabs, and the consequence is to raise the level of tension and frustration even further. Mr. McFerson often steps in as referee and puts a stop to this (something the President should be doing), and in doing so reclaims the high ground. But Ms. Smith's perseverance is paying off. Although the other Board members aren't yet agreeing with Ms. Smith, you can hear that Mr. McFerson has begun to sense that the public is less concerned about decorum and more concerned about whether their School Board is hiding things. Many folks remember that Rocky prevailed and pulled it out in the end, becoming the new Heavyweight Champion of the World. Except he didn't – Creed won by a decision and retained his title. It wasn't until Rocky II that Creed was defeated and Rocky became champion. Rocky and his advisors modified their mode of attack, but kept their heart. The combination was a winner. Our movement is starting to affect the way our school leadership works as well. Have you noticed that they enter Executive Session much less frequently these days? They still aren't having discussions in public to the degree I believe they should - and that the law requires. They clearly come to meetings having already reached a consensus on pretty much everything, as the comments they make are more justifications for the audience and the media than they are an exchange and discussion of ideas. If we want to change this, it is critical that members of the community show up at Board meetings, otherwise the Board has some justification (illegal as it may be) for not bothering to hold discussions in front of an empty room. One of the ways Denver City Schools is different from us is that they're having trouble hiring teachers, and getting teachers to work in some of their schools. We have no problem recruiting teachers - we have many applicants for every opening - and I assume no HEA member objects to teaching in any school in our District. But we may have a retention issue. I've heard people say that 50% of all new teachers leave the profession in the first five years. If that statistic applies to HCSD, then perhaps we also need to ask how many of those teachers are leaving because they've discovered teaching isn't for them, versus the number of promising and effective young teachers who leave - despite loving the vocation - because we don't pay enough for them to start a home and family. In Denver, they decided that the way they would solve this problem was for the more senior teachers to sacrifice a little in order to free the resources needed to recruit and retain the younger members who would follow in their footsteps. The answer wasn't to raise taxes yet again. The people of Denver had already signed on for substantial tax increases to fund the ProComp program. They've turned the Big Knobs, and now are doing the fine tuning. We're not going to 'fix' the funding situation in our District until we put our compensation strategy on the table for examination and adjustment. Meanwhile, we need to pass this 6.9 mill levy to keep the wheels on while we figure things out. There were a number of speakers at tonight's School Board meeting, and maybe 15-20 total members of the public in attendance. It's good to see public participation on the rise. All the speakers spoke in favor the levy, citing various reasonable points for why the levy should be supported by the community. More than one congratulated the district officials for our "Excellence with Distinction" designation on our State Report Card. I'd like to add my congratulations as well. Agenda Item F1 is a list of the cuts you will make to the FY10 budget should the 6.9 mill permanent operating levy not pass in November. However, you have not yet disclosed to the community what cuts you would make if the 6.9 mill levy passes. In other words, there must have been three budget projections developed in the past year. First, a budget that would be in effect with the passage of the 9.5 mill levy – now moot – which presumably would have fully funded our current staffing and programming without cuts. A second which would be put into effect with the failure to pass any new levy, which should be the first budget less the cuts you have described in F1, totaling approximately $11 million per year. And finally, a budget which would be put into effect should the 6.9 mill levy pass. Presumably it would be somewhere between the first two, requiring some level of cuts. Or perhaps your thinking is that the 9.5 mill levy would have fully funded all current staffing and programs for three years, while the 6.9 mill levy will fully fund all current staffing and programs for only two years. Whatever the answer, the point is that the public doesn't understand what we would be getting with the 6.9 mill levy that's different from the 9.5 mills, or zero mills. I'm making the assumption that these three budget scenarios were prepared in order to support the assertion by the Superintendent, the Board President and other Board members that "6.9 is as low as we can go" on this levy. Otherwise, the 6.9 mills is just a seat-of-the-pants number, and I'd hate to think our $150 million district is being run on a seat-of-the-pants basis. The remainder of the items on the cut list would be enacted at the beginning of the 2009-2010 school year. The Superintendent indicated that if cuts didn't commence on this schedule, the School Board would need to put a levy approaching "13-14 mills" on the ballot in March. I don't quite understand this remark, but I have always assumed that if the 6.9 mill doesn't pass this November, there is likely to be another levy on the ballot no later than Nov 09 anyway. Remember that in Nov 07, Treasurer Brian Wilson said that if no levy is passed, there will need to be $3.9 million in cuts in FY09 (which have already been enacted), another $18.2 million in FY10 (how did that drop to just $11 million? ), and another $3.1 million in FY11. In fact, it makes complete sense to say that for each year funding is held constant, more and more junior people will need to be laid off and more programs cut in order to pay the increasing cost of compensation and benefits of the more senior people. With no new money, the only way to fund 7% pay raises for some is to lay off others. I'm hoping the union members are discussing this and looking for other solutions (e.g. smaller raises across the board). On the list of cuts recommended by Superintendent Dale McVey if the November levy doesn't pass, the last item is "Eliminate evening, after-school & weekend building usage (utilities)"
A reader sent me a question asking whether I knew if there had been further discussion of this item. Her interest came from the fact that a group she is involved in currently makes use of one of the schools. Ohio Revised Code 3313.76: "Upon application of any responsible organization, or of a group of at least seven citizens, all school grounds and schoolhouses, as well as all other buildings under the supervision and control of the state, or buildings maintained by taxation under the laws of this state, shall be available for use as social centers for the entertainment and education of the people, including the adult and youthful population, and for the discussion of all topics tending to the development of personal character and of civic welfare, and for religious exercises. Such occupation should not seriously infringe upon the original and necessary uses of such properties. The public officials in charge of such buildings shall prescribe such rules and regulations for their occupancy and use as will secure a fair, reasonable, and impartial use of the same." (D) Polling places, for holding elections and for the registration of voters, or for holding grange or similar meetings. Within sixty days after the effective date of this section, the board of education of each school district shall adopt a policy for the use of school facilities by the public, including a list of all fees to be paid for the use of such facilities and the costs used to determine such fees. Once adopted, the policy shall remain in effect until formally amended by the board. A copy of the policy shall be made available to any resident of the district upon request." These are the current and applicable laws, and the Superintendent knows it but hoped to slip one by us because this is the kind of threat that might motivate people to vote for the levy. How Does This Protect the Schools, Mr. Mayor? A recent article in the Columbus Dispatch reported the fact that commercial growth might exceed residential growth in Hilliard for the first time in 30 years. It's not that commercial growth has been all that great of course – it's because the residential housing market has collapsed nationwide, and Hilliard is not immune to this condition. According to the Dispatch story, Mayor Schonhardt said: "We want continued growth without adding continued burden to the schools." He gives as an example of this policy the rezoning of land on Trueman Blvd from what was supposed to be 246 apartments to professional offices. I'm not a professional real estate investor, but I am a retired professional who derives my income from investments – a good chunk of which are real estate partnerships. One thing I know from my involvement in real estate is that you don't construct a building just for the fun of it and hope that someday you might get some tenants. You would much rather build having already signed up some tenants, or at least know that there is plenty of demand for the kind of building you intend to construct. On that basis, I expect that the driving force for changing the use of this Trueman Rd parcel had little to do with protecting our schools, and everything to do with the belief by the developer that more money could be made leasing professional space than apartments. Personally, I'd put my money into a professional space before apartments every time – fewer tenants, fewer problems/complaints, longer leases, less overhead keeping units filled – it's just more profitable. On September 11, the Hilliard Planning and Zoning Commission is scheduled to hear a request to rezone 58 acres at the northwest corner of Cemetery Rd and Britton Parkway from Medium Manufacturing to Planned Unit Development. This is the site where Dana Corp once had a significant manufacturing operation. When the Data plant was in operation, it was a major employer and generator of income tax revenue for the City of Hilliard, and it paid significant real estate and personal property taxes to the school district. Even today as an empty parcel, it generates $47,298.07 in annual school property taxes. And not one kid is added to the student population. "The Planned Unit Development District is intended to provide incentives to encourage its use by permitting certain variations from normal development standards." I take that to mean a PUD is used when the city has a hunk of land it wants to have developed, and it can't get anyone to develop it under existing zoning standards. Therefore some standards will be relaxed or modified to encourage the developer to make the investment. More residential development helps neither the City of Hilliard, which needs commercial development to create jobs that generate income taxes, nor the Hilliard City School District, which needs property taxes from commercial rather than residential sources. The school funding problem we have in Hilliard and other central Ohio suburbs has nothing to do with the constitutionality arguments which have reached the Ohio Supreme Courts. That whole situation is about rural districts with low land values, mostly because farmland by law is taxed at a small fraction of its true value. The suburban funding issue has three components: a) the real estate taxes paid by the average suburban home is only a third of what it takes to educate the kids who live there; b) the fraction of school funding that is paid by local businesses is getting smaller and smaller; and finally, c) the State of Ohio has shown that it's willing to fix the funding problems in the rural and urban districts by diverting money from the so-called wealthy suburban districts. The constitutional amendment championed by the Ohio Education Association (the teachers' union), would make this situation worse. We can't do much locally about the third factor, but the first two are completely under our local control, or at least the control of our local elected officials. Politicians like Don Schonhardt and Dan Nichter have moved into Hilliard to harvest it – not serve the people who live here. It's the same story in all the I-270 suburbs of central Ohio – the developers get what they want, aided by friendly politicians who operate largely ignored by the public, and in the process destroy the economic viability of every community along the way. This process is described beautifully in Gregory Jacob's book Getting Around Brown. While this book is no longer in print, it is available at the public libraries, and its full text is available online at The Ohio State University Press. Our silence is all the permission the politicians need. Remember that Mayor Schonhardt ran unopposed for re-election last November. As is true for the majority of folks living in the Hilliard City School District, I am not a resident of the City of Hilliard. 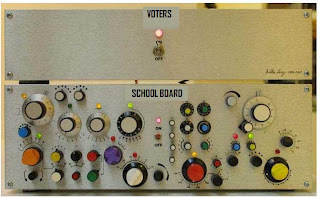 I don't get to vote for City of Hilliard elected officials, but I – like many of you – will pay directly for the development decisions they make, as well as those made by all the other municipal goverments that control land use within our school district. Our shared voice in all this is the School Board. I believe it is vital that they develop a formal policy statement regarding residential development in the school district - in particular tying the pace of residential development to commercial development to ensure that our funding gets no further out of whack. This is a revision of the original story. I wrote the first version making the assumption that the name "Village at Britton Parkway" was an indicator that a new high-density, entry-level Dominion Homes development was going to take place on this commercial/industrial parcel. That assumption was in error. The current zoning application calls for a mixture of retail, office and residential space. In particular, the current application calls for over 300 condominiums. The second thing I need to clarify is that this is a zoning application, not a development or building permit application. Chances are good that the current landowner, First Industrial LP, is not planning to be the ultimate developer of this property, but rather that they have a prospective buyer who has said they'll buy and develop the property only if First Industrial LP is successful in getting it rezoned. I considered just deleting this story, but there are points in it which are valid and important nonetheless. If multi-family or condiminium homes are developed on this parcel, there could be significant impact to our schools. Our continued attention to this and all Hilliard annexation and rezoning actions is vital. My apology for the false alarm. A suggestion came in that we tell folks how to sign their comments anonymously without actually using the "Anonymous" choice. This would make it much easier to figure out who said what to whom. It turns out to be pretty easy: just click the "Name/URL" button below the comment box instead of "Anonymous" and you'll get a box in which you can enter a name (you can ignore the URL box). You can use your name or an alias - doesn't matter to me as long as it's something in good taste. Thanks for the suggestion, J - aka "anonymous"
3. How large that next levy might need to be. Using the revenue and expense numbers in Brian’s 5 Year Forecast, and presuming that you will strive to restore the 10% operating reserve which is your official policy, I calculate that a levy in two years will need to be 11 mills. As one commenter on my blog noted, you are just kicking the can down the road, and not dealing with the root issues – with the major one being our compensation and benefits philosophy. If it is true that a 9.5 mill levy would have necessitated no additional cuts, and that with no new levy, $11 million/yr in cuts would be needed, then the math suggests that if a 6.9 mill levy is successful, there will still need to be $3 million/yr cut from the budget. I have an idea for how to do that. Without question, some or all of the $3 million in cuts will have to taken from the compensation and benefits categories, which make up 90% of our operating budget. Since that budget is about $100 million/yr, $3 million/yr is about 3%. The usual way of cutting money from compensation and benefits is through layoffs. The HEA and OAPSE contracts specify that it will be the members with the least time on the job who will be laid off first. I certainly wouldn’t want to be a young teacher who gets laid off after the first two or three years on the job. My suggestion is to instead ask all employees – HEA, OAPSE and Administrators – to give back 3% from their last contracts. This 3% giveback could be accomplished by using the 2007 pay schedule for 2008, the 2008 pay schedule for 2009, and the 2009 pay schedule for 2010. I am not calling for any changes to the step schedule in this adjustment. Administrators would need to make a 3% giveback as well. The point of such a giveback by the employees would be to demonstrate to the public that we’re all willing to make sacrifices – to meet somewhere in the middle. I think that this gesture by the employees would greatly improve the probability of passage of the 6.9 mill levy. And this giveback would demonstrate to the most junior members of the HEA and OAPSE that their elder members are willing to sacrifice a little to preserve the jobs of the younger ones. Doing your job well – and our district team certainly does – isn’t enough. The many employees of Skybus did their jobs well, and they all got laid off anyway. The 10,000 people employed by DHL in Wilmington do their job well, but they’re going to lose them regardless (can you imagine the stress in Wilmington City Schools right now?). I wish our current economic conditions were better. I have confidence that better days are ahead, but right now the amount of money spent on the compensation of our district team needs to be recalibrated to match up with general economic conditions. This giveback program I am suggesting will accomplish that with no layoffs. It seems like the most reasonable solution to our immediate situation, and would give us all time to design a new system with a sustainable balance of funding and compensation. The School Board held a Special Meeting at 7pm tonight for the purpose of hearing presentations from the executive leadership of the District on various financial scenarios, leading up to its decision on the size of the next levy. The meeting was in two parts. The first part was a reasonably detailed presentation of what would be cut from the 2009-2010 budget if the levy doesn't pass. The detailed list is supposed to be posted on the district website soon, but here is a preview: (The official document is now posted here). The presentation ended at 7:40pm, giving the Board a time to ask additional questions, consider options, and express opinions. Pretty much all they did was make statements expressing the same general opinion – that this levy must pass because these cuts are severe and would rewind years of progress in our school district. My expectation for the second part of the meeting was that the Superintendent and Treasurer would present scenarios for levies of 6.9, 7.9 and 8.9 mills. In other words, if the list above is the cuts the executives recommended should no levy pass, what would the cuts look like if a levy were passed for a lower levy amount that the 9.5 mills that was defeated in March? In my management career, I've both prepared and been presented budget scenarios many times. So what I was expecting next was a spreadsheet with four columns, one each for 0 mills (i.e. levy defeat), 6.9 mills, 7.9 mills and 8.9 mills. Each column would show the expected revenue and the projected expenses, pretty much in the same format as the Treasurer's Five Year Forecast. From this macro perspective, we could understand which major line items would change given the different revenue estimates. From there, I would expect a drill down to about the same level of detail as the 'no levy' analysis presented at the beginning of the meeting. I expected the Board to have some conversation among themselves about which scenario looked the most reasonable, and to start making a plan for communicating their reasoning to the public. This would make for a very informative meeting. What actually happened astonished me. Superintendent McVey commented that the community is saying that for a levy to pass, it needs to be more affordable. He told the Board that he felt it needed to be the lowest number being considered – 6.9 mills. Valid opinion, but where's the analysis? President Bobbitt said she had asked Treasurer Wilson to prepare a 6.9 mill scenario (but none was presented at the meeting). When Bobbitt asked how long he thought a 6.9 mill levy would last, the Treasurer gave a whole list of caveats about projected revenue, and then said it would probably last two years. Translation: This will be a permanent levy and it will last forever, but we'll be asking you for more money in two years. Doug Maggied brought up the cost of diesel fuel, natural gas and electricity. Andy Teater said 6.9 mills is as low as we can go. How does he know? President Bobbitt agreed that 6.9 mills is as low as we can go (how does she know? ), even if it requires additional reductions. However, she said, it signals the community that the Board is listening. Superintendent McVey said he would have the resolution drawn up for a 6.9 mill levy, ready to be voted on by the Board at their regular meeting, next Monday, August 11, and then submitted to the Board of Elections for placement on the November ballot. I am astonished that this Board would make such an important decision with virtually no data or analysis. Most of the Board members have no clue how much in the way of cuts would still be needed if a 6.9 mill levy passes, or where they would make those cuts. My quick estimate was that it would take somewhere on the order of $3 million in cuts to balance the budget is a 6.9 mill levy is passed. When we chatted after the meeting, Board member Dave Lundregan told me he had estimated about the same number. A third person in the audience said he also had estimated this amount, so it's probably a good number to work with. But there's another variable – the interval until the Board expects to put another levy on the ballot. The size of the current levy. The larger the levy put in place now, the more options for the future. The Board can either 'buy down' the next levy with a larger levy now, or extend the interval until the next levy needs to go on the ballot. The size of the next levy. In general, the smaller the current levy, or the longer we wait until putting another levy on the ballot, the larger the next levy needs to be. The interval until the next levy. One way to decrease the size of the current levy is to shorten the timeframe until the next (permanent, additive!) levy will appear on the ballot. Notice that the descriptive language I used was a bit redundant. That's because these three elements are tightly coupled to each other – a change in one changes one or both of the others. I've asked the Board on several occasions to talk about all three numbers as a set, but have been pretty much ignored. I believe the Board came into tonight's meeting already set on a 6.9 mill levy, which is disturbing because it would signify a violation of the Sunshine Laws. The only other conclusion is that all it took was the Superintendent and President to suggest 6.9 mills, and the rest of the members fell into lockstep. I also believe the President signaled that she believes this levy will produce only enough funding such that another levy will be needed within two years. Of course, that depends on the size of the cuts made even if the levy does pass. And finally, I believe this Board has absolutely no clue what the size of the next levy might need to be to continue to cover the costs associated with the new union contracts, which will add somewhere around $10 million/yr to our operating expense. What a horrible position this Board has put our community in. Our school system is a $150 million/yr enterprise, serving 15,000 kids with 2,000 employees, utilizing an asset base valued at nearly $140 million (and a replacement cost of at least $300 million). That's a big outfit, requiring highly skilled and experienced leadership. Or at least a leadership that recognizes its shortcomings, and seeks counsel from those who can fill those gaps. There are many skilled, experienced and capable people in this district that could help if our leadership were willing to recruit the right folks and give them the opportunity to have an impact without a lot of bureaucratic crap. Do you know what I think would go a very very long way in getting this levy passed? For the HEA/OAPSE members and Administrators to step up and say they'll roll back their salary increases enough to absorb the shortfall. With gross pay at approximately $100 million/yr, this would mean knocking about 3% off their paychecks. The unions could figure out how to enact that, by eliminating the 3% base pay increase they just negotiated and keeping the 4.15% step increases for the 70% of the members eligible, or taking a little out of each, or many other permutations. But with a give-back like this, all programs, services and jobs could be maintained. That would send a message to the public. There will be a special meeting of the Board of Education of Hilliard City Schools at 7pm on Monday, August 4, at the Central Office Annex. No agenda has been published, but it is my understanding that the Board will be presented with various scenarios of levy amounts and budget cuts. As required by the Ohio Sunshine Laws, all their discussions on this matter must be held in public session, and one would think they have much to discuss. I encourage community members to take the time to attend and observe the presentations and discussion first hand. The deadline to file the levy paperwork with the Board of Elections is August 21. The Board is scheduled to approve the final resolutions at the following Board meeting, currently scheduled for Monday, August 11 at 7pm, also at the Central Office Annex.